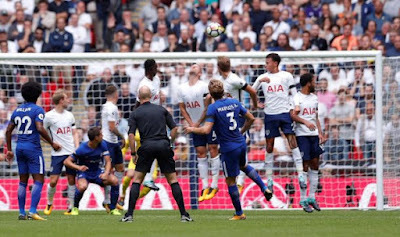 Tottenham 1-2 Chelsea: Antonio Conte's tactical masterclass leads to massive win for the blues. 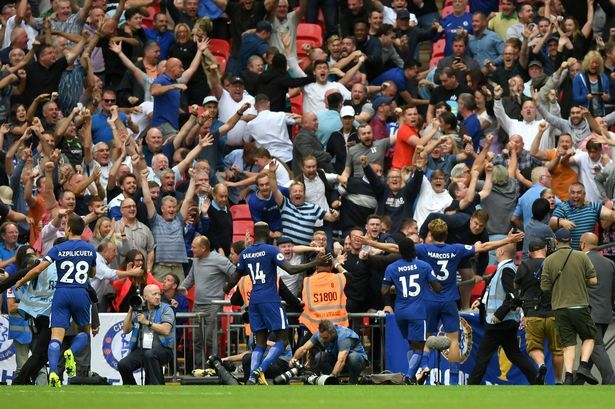 Two goals from Marcos Alonso sealed a much needed and vital three points for Chelsea at Wembley. Antonio Conte's tactical masterclass frustrated the life out of Tottenham who had to rely on an own goal from Michy Batshuayi to register on the score sheet themselves. There had been been plenty of comment ahead of the game of Chelsea, Diego Costa, the suspensions of Gary Cahill and Cesc Fabregas and a threadbare squad that would lead to our downfall at Wembley yesterday afternoon. Heading into the game, Tottenham having beaten Newcastle last weekend, were considered strong favourites and according to the press a defeat for Chelsea would lead to yet another managerial meltdown. You could get impressive odds from top uk betting sites for such a collapse to happen! 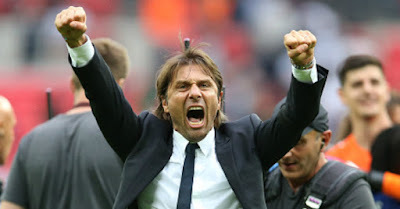 However, Antonio Conte proved and demonstrated once again that he is up their with the best managers in the world when it comes to tactics and how to set a team up to win a game. Being honest, I honestly thought that it would be important for Chelsea to play the majority of the back six that had played together for most of last season with Toni Rudiger replacing Gary Cahill. This would mean that Victor Moses would back in down the right hand side, Marcos Alonso on the left with Cesar Azpilicueta moving back alongside David Luiz on the right with Rudiger on the left. After last weeks shambolic first half defensive display I thought it was vital to get stability. 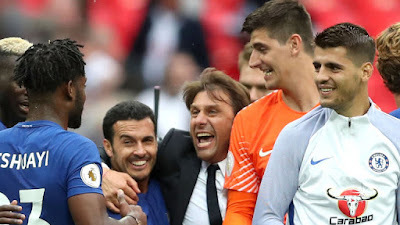 Antonio Conte decided differently and introduced the outstanding Andreas Christensen to play through the middle of the back three with David Luiz stepping forward into a three man midfield alongside Tiemoue Bakayoko and N'Golo Kante. Christensen and our defensive three made countless blocks, numerous tackles and clearances throughout the game as Tottenham became more and more frustrated. David Luiz later revealed that it was his job to stop Eriksen and Dele Alli from moving into space and picking up the ball between the defensive and midfield lines and also did a great job there. N'Golo Kante is N'Golo Kante and again was all over the place winning tackles, closing people down and putting himself about while Bakayoko had a steady game showing that he could easily deal with the pace and fury of the game in this country. There is plenty more to come from him. Willian was deployed as a number ten supporting Alvaro Morata who was given his first start up front. Morata should have scored early in the first half as with a clear header he put the ball wide when it seemed easier to score - he will score plenty don't worry. Both teams hit the post in the game as Willian and Harry Kane struck the woodwork but that was as close as Tottenham had came up until the own goal. Yes, there were some dangerous moments with balls being crossed into perfect positions but for no-one to capitalise and knock the ball into the net. Yes, Tottenham dominated the game but possession means nothing if you do not take advantage. 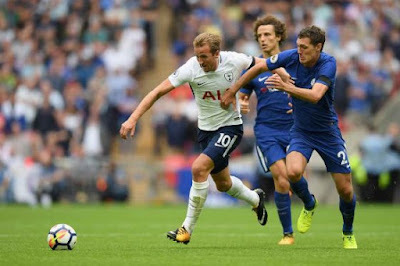 Chelsea were working hard without the ball and looked to cease on every opportunity in the game to get forward and to attack Tottenham and having already scored with a wonderful free kick in the first half after David Luiz was fouled outside the box, Alonso struck the killer blow with three minutes remaining to seal a vital three points. Luiz stepped forward as Tottenham looked to hit us on the counter-attack, he won the ball back halfway inside the Tottenham half and rolled the ball out to Pedro who had come on for Willian, Pedro saw the run into the box of Alonso and with all the time in the world, under no immediate pressure, struck the ball hard and low through the pathetic attempt by Lloris to save and into the net to send the Chelsea fans delirious. The victory and our performance sends a message to rest of the Premier League and to those people writing us off. It showed that everyone is together and every player is with the manager. There had been talk of another repeat of what happened to Jose a couple of seasons ago but this performance proves that it will not happen under Conte. He demands hard work and graft and he got that at Wembley from everyone which was so impressive. You are a fool to write Chelsea off under Antonio Conte!